Create an impression with customized printed tissue papers of your brand. Printed tissue rolls serve as the best catalyst to reach the targeted audience and thus enhance your business. 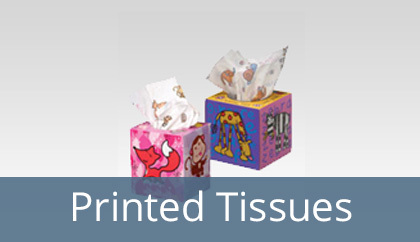 Lotus tissue is a manufacturer and supplier of printed tissues that are skin friendly, beautifully designed as per your requirements. The Printed Tissues can be used in a number of industries like Hotels, Resstaurants, Organization etc to promote their brand and take business to a higher level. You can avail these tissues at industry leading price in comparison to others, as all our products and services are designed to meet your expectations.